A genuine coffee house experience is just a pour away! No waiting - just add 7 parts water to 1 part DaVinci Gourmet Cold Brew Concentrate - any time you need it! 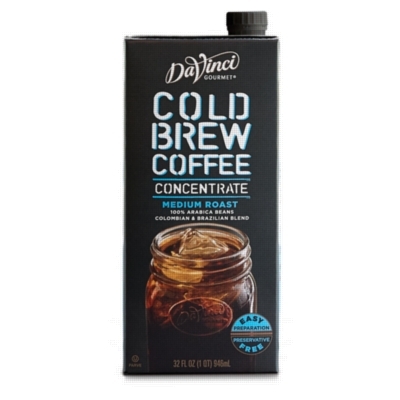 Get in on the hottest trend with cold brew coffee ... less bitter, less acidic, smooth, and naturally sweet tasting DaVinci Gourmet Cold Brew Concentrate. What�s behind our brew? 100% Arabica Colombian & Brazilian beans, medium roasted delivers slightly caramelized aroma and flavor with a hint cocoa. Our process does the work for you delivering consistent and signature cold brew � just add water! Each 32oz carton yields 2 gallons of prepared cold brew. Our cold brew coffee concentrate is Shelf Stable, Easy Prep and Preservative Free.